Become one of the Nightingales, Nocturnal's guardians. Speak with Brynjolf and Karliah at the Thieves Guild. Meet Karliah at The Shadow Stone just outside Riften. Enter Nightingale Hall and follow Karliah's instructions. Proceed further into the cave and follow Karliah's instructions. Speak to Brynjolf about the leadership of the Guild. Return to the Thieves Guild after your search at Riftweald Manor to show Brynjolf Mercer's plans for stealing the Eyes of the Falmer. Brynjolf will explain the significance of your findings; Mercer plans one more heist before disappearing for good. The only hope of catching him is to intercept him at the location. Brynjolf informs you that Karliah has requested to speak with both of you. When you speak to Karliah, she reveals to you and Brynjolf that Mercer Frey was a Nightingale, an agent of Nocturnal. Because of this, Karliah is concerned about being at full strength and on equal footing before pursuing Mercer. She asks you and Brynjolf to meet her at The Shadow Stone outside of Riften. Here you will find yourself at the entrance to Nightingale Hall wherein is the edge over Mercer that Karliah was alluding to. Proceed inside, but don't get too far ahead as Karliah begins telling you more about the Nightingales and their role. She will later remark that this was the Nightingales' base, and that she will return here once done with Mercer. After crossing a bridge, you can find a copy of the Pickpocket skill book Purloined Shadows to the right. Your first stop is the armor chamber. Activate the stone Karliah indicates and the Nightingale Armor is placed in your inventory. You must equip it in order to continue. Once you have donned the armor, Karliah will discuss the next step: your sworn oath to Nocturnal. Follow Karliah further into the cave past side passages leading to sleeping quarters where you can find a copy of the Sneak skill book The Red Kitchen Reader and living spaces. The first step towards your induction. Once you have agreed to Nocturnal's conditions on becoming a Nightingale, Karliah will operate the pull chain for the gate leading into oath taking chamber. You will be directed to stand on a specific platform. If you have a follower with you, their presence does not affect the outcome in any way. Karliah summons Nocturnal and asks to resume her role as a Nightingale as well as induct you and Brynjolf into their ranks. Nocturnal agrees. Now that you are officially inducted into the Nightingales, Karliah will explain that Mercer got into the vault by using the Skeleton Key which he stole from the Twilight Sepulcher; a grievous insult to Nocturnal which threatens the very foundations of the Nightingales. The key needs to be returned to the Sepulcher to set things to right and return the uncanny luck of the Thieves Guild. This is a big day for you as now Brynjolf has something to add. With Mercer disgraced, the issue of the leadership of the Thieves Guild is at hand. Brynjolf states that he and Karliah think you would be the right person for the job, once you proven yourself by dealing with Mercer and completing all of the Thieves Guild additional jobs. From here, leave for Irkngthand to begin Blindsighted. 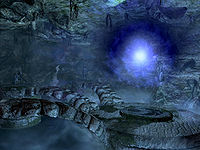 Brynjolf may not begin walking towards Karliah in the Ragged Flagon and the dialogue will not initiate to begin the quest. Reloading from an earlier save may fix this. Use the console command setstage TG08A 15 to have her start speaking, regardless. If Karliah or Brynjolf are stuck (won't move, don't complete actions), the console command resurrect will sometimes force them to resume their usual scripted behavior. It's possible that Brynjolf will walk away when you've arrived in the hall and are asked to get your armor. Push him through the cave. You can use the console by clicking on him (or typing prid 20545), and then typing moveto player to teleport him to you. Make sure he's near you when you don the armor when Karliah is about to ask you to take the oath, which should fix his AI (confirmed by his comment on his new outfit). 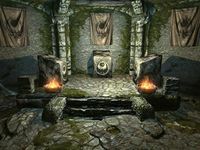 If only you and Karliah make it to the stones before taking the oath and Brynjolf is still walking away, use console command setstage TG08A 55. This starts the cinematic sequence without Brynjolf, who will join the show slightly later. Karliah sometimes may not meet you at Nightingale Hall, making the quest impossible to finish. Karliah will sometimes go back to the Frozen Hearth where you have met to decrypt Gallus' journal. It is related to the bug in the quest Hard Answers where the stages will not update. Redo Hard Answers step by step, and the quest Trinity Restored will reactivate. You can use the console and type setStage TG06 60 and go to the cellar in the Frozen Hearth to talk again to Enthir and Karliah. After this Karliah and Brynjolf will be at the entrance of the Nightingale Hall. (You can further check if this is the problem by typing getStage TG06 in the console. If the Stage is smaller than 200 then this is the cause of Karliah's disappearance). If setting the stage to 60 doesn't work, enter setstage TG06 200 to complete the quest Hard Answers. Karliah will then begin her long trek to Nightingale Hall. Fast travel to the hall, wait for 24 hours and she will show up. Alternatively, type in the console prid 00020545 (for Brynjolf) or prid 00058F1A (for Karliah), followed by the command moveto player. Use the latter command as many times as necessary to lead the selected NPC to the stones; you may need to activate the stone multiple times to get Brynjolf and/or Karliah to equip their Nightingale armors. You may still be required to use the command as you continue further down the halls. Do not use the placeatme commands unless either NPC has completely disappeared from the game (i.e. not stuck or lost), otherwise you will create a clone of the NPC which may cause undesirable results in-game. Sometimes, Karliah will simply turn around and walk out of the cave instead of opening the gate. As she is the only one able to open it, this will render the quest impossible to complete. After Brynjolf accepts the terms of becoming a Nightingale, Karliah will ask you if you accept. Accept the terms, Karliah will then turn and head to the gate. Immediately interrupt her and ask her any question. This lets Brynjolf move ahead of her and fixes this bug. Attacking Karliah may cause her to turn around and open the gate. Exiting the conversation with her will allow the stage to reset itself, and may fix this. Since the bug seems to involve the conversation with Brynjolf, you can sometimes circumvent the bug by talking to Brynjolf continually until Karliah opens the gate. You can also fix Karliah from walking away if you tell her that you don't understand the full meaning of being a Nightingale. She will ask you again and then if you say you are ready, you can enter the room to finish the ritual. Before accepting Nocturnal's conditions from Karliah, force her to and keep her directly at the gate using Unrelenting Force and Paralyze. Accept the conditions and keep her at the gate until Brynjolf joins you both. She may then pull the chain and progress the quest. Open the console, click on the gate and use the command disable, then set stage tg08a 52. You can now see the cinematic involving Nocturnal. As with all console commands, exercise extreme caution. Karliah may be going to the exit instead of opening the door to the Nightingale contract. To repair this, use disable on the door, and use disable on Karliah and enable to fix her before using moveto player to teleport her to you. After that, use setstage tg08a 52 and they may walk to their own spots. The same can be done as above only instead of disabling the door, it is possible to run activate 58f1a on the door (which simulates Karliah pulling the chain instead of removing the door from the game). Also, you can attack Karliah while she is talking to Brynjolf and use relenting force to move her to where the chain is. After, use Emperor's Voice to calm her down and then talk to her. She will then pull the chain and you can proceed. If you are not an imperial and do not have this power, you can use the command /showracemenu to change it to imperial and then change it back to your original race. The following solution worked on multiple tries. After accepting the oath, run up to the chain by the bars and open up the console and execute the following commands prid c6996. Then execute activate 58f1a. That should simulate Karliah pulling the chain to bring the bars down. Run inside and then bring up the console again and execute prid 58f1a and then moveto player to teleport Karliah to you. Once you and Karliah are both inside execute setstage tg08a 52 to progress the quest. When you stand on the marker to summon Nocturnal, nothing may happen. Move around a little until the cinematic begins. If the above fails, make sure you have exhausted all dialogue with Karliah and try again. After entering Nightingale Hall and donning the Nightingale armor, Karliah may pull the chain for the gate twice, when it should only be once. Because only Karliah can activate the chain, this can be problematic, trapping Karliah, Brynjolf, and possibly you inside or outside the cave. Quickly talk to Karliah before she can pull the chain a second time. If you enter the cave with your followers, Karliah may stop before the bridge and not go any farther. Have your followers wait outside. 10 Before intercepting Mercer Frey, Karliah wishes to speak to both Brynjolf and myself. 20 Karliah has indicated Brynjolf and I are to meet her at an old standing stone just outside the Southwest Gate of Riften. Her motivations for doing so are mysterious, but I suspect it has something to do with the Nightingales. 40 Karliah has informed Brynjolf and I that we're to join the elite ranks of the Nightingales and assist in reforming the trinity that was disrupted over twenty-five years ago when Mercer Frey murdered Gallus. 57 I've undertaken the Oath and I'm now a Nightingale, guardian of the Twilight Sepulcher and a dedicated sentinel of the goddess Nocturnal. 200 Finishes quest Karliah has finally revealed the fundamental mission of the Nightingales... the guardianship of the Skeleton Key of Nocturnal. This powerful artifact, normally kept safely within the Twilight Sepulcher, has been stolen by Mercer Frey. As a Nightingale, the duty to recover the Skeleton Key falls squarely upon my shoulders. The following empty quest stages were omitted from the table: 0, 25, 35, 42, 47, 52, 55. On the PC, it is possible to use the console to advance through the quest by entering setstage TG08A stage, where stage is the number of the stage you wish to complete. It is not possible to un-complete (i.e. go back) quest stages, but it is possible to clear all stages of the quest using resetquest TG08A. This page was last modified on 17 October 2018, at 18:58.